It does not matter what grade, star or rating your property has, every establishment that rents out a room for the night is fundamentally selling a good nights sleep on a clean mattress. The decor, linens, service and Spanish donkey will count for nothing if your guests do not receive this basic component. Whether you are a proprietor of a hotel, guest house or B & B, there is absolutely no reason to pay over the odds for a mattress. It is acceptable practice to quantify the cost of your mattress to the ‘price per night principle’. For example At a hotel with the most impeccable standards, they will usually allocate just £3 towards the cost of a mattress out of the room revenue taken for that night This means that they will have an annual budget of around £1000+ towards the cost of the mattress. If their room occupancy is above 75% then they will be looking to change the mattress at around the six month time. With the principle being the newer the mattress the better. In short, for the above average establishment, a cost of £2 per night will get you an extremely good quality mattress, looked after and replaced once a year will ensure your guests have a comfortable and clean sleeping environment. How many establishments do you know that make the claim – Our mattresses are replaced every 6 months? and judging by this article in The Guardian it would make vast commercial sense if they did! Your room occupancy will dictate the frequency of how often you change the mattress. The low average is once per year, taking in one busy season and a quiet season representing an average 75% occupancy rate. It doesn’t beggar belief that when you stay in a hotel or B & B you get this irresistible urge to see what the mattress is like! The very last thing you want to see is any staining. Also, the other last thing you want to see is a plastic coated mattress like they have in hospitals. Knowing this, it does make commercial sense that your mattress should be spotlessly clean and comfortable. We all sweat about each night. The ultimate aim for the hotelier is to keep the guests bodily fluids away from the actual mattress as much as you can whilst ensuring it is also comfortable. All hotels should have at the very least a mattress protector of some sort preferably, the most absorbent. I also recommend that an additional soft layer of absorbent material such as a wool rich blanket is used beneath a mattress protector. This can act as a final vapour barrier. What about fire regulations for commercial mattress use? The Fire and Furniture (Fire) (Safety) Regulations only apply to furniture intended for private use in a dwelling. Because the mattresses in question are destined for to be used in hotels/B&B/guesthouses, which are considered medium risk premises, higher levels of safety testing, than for domestic furniture, is required. N.B. All mattresses sold on this site conform to this standard. Furthermore, the mattresses for medium risk establishments must also comply with BS 6807 – methods of test for assessment of ignitability of mattresses, upholstered divans, and upholstered bed bases with flaming types of primary and secondary sources of ignition, which is also part of BS 7177. This Standard [BS 6807 also known as Crib 5 / Source 5] exceeds the levels of ignition tests required by BS EN 597 – 1 and BS EN 597 – 2 and should be read in conjunction with such. Feel free to contact us if you are looking for replacement mattresses for your business. We will be able to provide all alternative options such as base styles and mattress longevity ensuring you get the look you want at the right price. 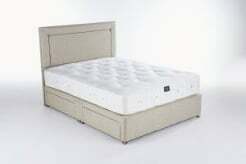 Our Origins 1500 mattress or Origins Reflex are both a great place to start for purposes of a guest house as they will tolerate a number of weights and is a great all-rounder. It must be understood that all mattress components manufactured in the UK / Europe are subject to the highest FR (Fire Retardancy) tests. Many components exceed what is expected and you should not unduly worry about this aspect. However, FR regulations that apply to your premises should not be taken lightly.